found each other again, but too late for an happy-end. Francesco (Dmitri Hvorostovsky) to defend herself. 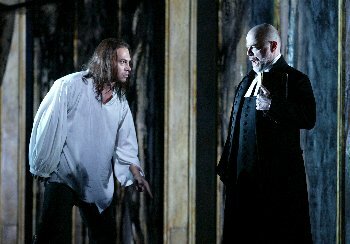 The opera tells the story of the count's son Carlo (tenor), who believes to be disowned due to a by his sly, younger brother Francesco (baritone) forged letter of his not in a good health being father, the Count Massimiliano von Moor (bass), and becomes the leader of a band of robbers and murderers. His fiancée Amalia (soprano), who is at the same time the niece of the count, waits in vain for his return. When the count hears through a by his son Francesco faked story from the supposed dead of Carlo in a battle, he collapses. Francesco declares his father to be dead and throws him after his awakening in a prisoner's tomb. 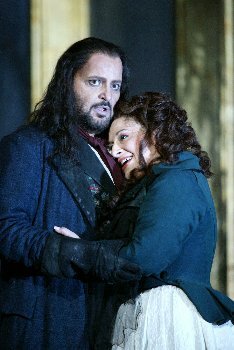 By the servant Arminio (tenor), who does not cover any longer Francesco's lies, Amalia hears the truth that neither Carlo nor his father are dead. She resists the declarations of love and the obtrusiveness of the new count Francesco, who wants to take her as his wife, and she escapes from the castle. In the night of thunder and storm she meets by accident Carlo, who also frees his father. Finally she has to realize that Carlo has become a robber. Since she does not want to leave him nevertheless, but Carlo wants to spare her a life as outlaw, he kills her and is murdered afterwards by his own people. His brother Francesco was hit by nightmares and begged the priest Moser (bass) for absolution, which he is not granted by the priest. Francesco is finally killed by the robbers as well. requested absolution to Francesco (Dmitri Hvorostovsky). 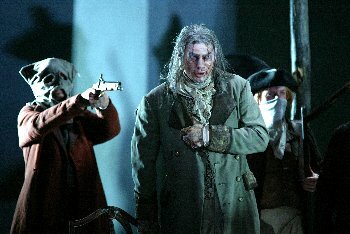 The London production, which has been shown at some festivals already in the Verdi year 2001, had its premiere at London end of September. The performance of October 11, 2002, has been the fifth at the Royal Opera House Covent Garden. As the Rigoletto performances also the I masnadieri - performances shined by its outstanding cast. 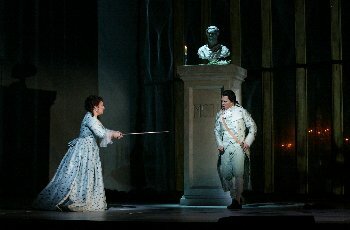 Especially difficult to sing is the role of Carlo, which starts with a lyrical aria, heightens into the dramatic spheres and comes at the end back to the lyrical. The American tenor Franco Farina succeeded in this change from the lyrical into the dramatical and back into the lyrical field with in its whole range certain, expressive, beautiful phrasing voice and his in all registers pleasant timbre. Especially touching is his duet with this father, who gives him the blessing of a father without knowing that his own son is kneeling in front of him. With an impressive, waarm voice in full bloom and with dignity acts the German bass René Pape as Count von Moor. Without any problems the soprano Paula Delligatti swings her beautiful sounding soprrano into the heights, but also in the middle-range her voice is convincing. Dark and a bit far behind, but very fitting for the role of the sly Francesco, sounds the in good line guided baritone of Dmitri Hvorostovsky. Credible is his madness at the end of the opera viewing his near end. Powerful and impressive is the bass of Eric Halfvarson as Pries Moser. his son Carlo and his niece Amalia die. he experienced Verdi interpret Edward Downes in front of the orchestra of the Royal Opera Houses acts as a convincing champion of the opera, who manages to fill all the changes in the mood and atmosphere with life. As in all Verdi pieces also in I masnadieri the choir takes an important role and in the end the robbers are those to decide about life and death. The production of Elijah Moshinsky with the designs of Paul Brown and the lightning of Howard Harrison stays fortunately in the time of the libretto in the beginning of the 18th century as well in the stage design as in the costumes. The revolving stage was used skillfully by the director. A nice idea was to show Carlo, when Amalia was singing about him full of longing, at the window of the winter garden. Though with I masnadieri Verdi did not proceed on his way to a psychologizing music drama, but the opera owns wonderful melodies and offers the soloists great moments to present their vocal gifts. From this view the opera is without doubt an enrichment of every operatic repertory.